Indiana isn’t often the first state that comes to mind when thinking about haunted places in America. However, it is home to one of the most haunted structures in the country. The Historic Hannah House, a 24-room mansion, hosts dozens of events each year: Easter egg hunts, Civil War reenactments, weddings, and corporate gatherings. Despite this wholesome façade, the building is, apparently, insanely haunted. The Hannah House was a well-known stop along the Underground Railroad, serving as a safe place for escaped slaves to rest during their northern migration. On one tragic night, a group of former slaves were crammed into the dark, dirt-floored basement, waiting for an opportune moment to leave for freedom in Canada. One unknowingly tipped over an oil lamp, which instantly ignited a fire. Many of the people in the basement were killed by smoke inhalation and severe burns within just a few minutes. In an attempt to cover up all traces of the incident, the dead were buried in the basement. Since this tragedy, the basement of the Hannah House has been known as an area for paranormal activity. Visitors and staff members report hearing disembodied footsteps, feeling cold spots, hearing strange noises, and experiencing strange smells. It appears that several of the people killed that evening may have stuck around, continuing to hide in the basement that once protected them. In addition to these ghosts, several staff members have reported seeing a ghostly man on the property. A man in a black suit, who has been spotted in several spaces in the building, is rumored to be Alexander Hannah, the builder of the home. If you find yourself in this part of the country, I encourage you to check this place out. Regular tours through the building’s most haunted areas are available to guests. 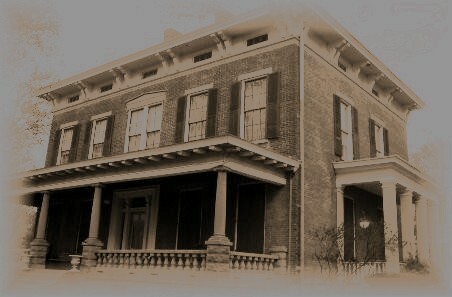 If you visit at the end of the summer, you might even catch them during the Hannah House Paranormal Day Celebration, which takes place every August.